February, how I do love you! 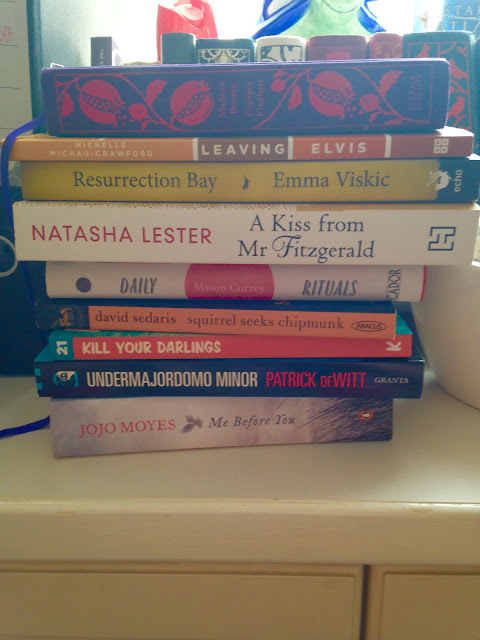 This last month has been spent reading, writing and generally doing bookish things. The Perth Writers Festival was on, which meant that I got to meet lots of wonderful writers from other places and catch up with some of my favourites from this wonderful place, Perth. I really like the Perth Writers' Festival and I am enjoying seeing it go from strength to strength each year. We have a really vibrant writing community in Western Australia-- it's warm and welcoming and there is a lot of talent, so I hope that the festival continues to get bigger and better. I am ashamed to say that I'd written this book off as one love story I was probably never going to get to-- and then I saw the amazing movie trailer when it was realised on the Penguin books Facebook page. This book was just what I needed, when I needed it. I took it to bed with me and stayed in on one of my days off, allowing myself to immerse in the world of it. It is the story of Lou Clark, who loses her job and finds herself taking a position as a carer for a man who has been paralysed in a motorcycle accident. Warning: you will need tissues! I had the pleasure of seeing Patrick DeWitt interviewed by Annabel Smith at the writers' festival, and now I have seen him speak I like him all the more. This is a bizarre, gothic-parody style novel about a chronic liar named Lucien Minor who journals to a castle owned by a mysetrious Baron to become the Undermajordomo (minordomo). It's funny, clever and really interesting so give it a go. If you're not familiar with Kill Your Darlings literary journal, head over to their website and check it out. They've published stories and articles by lots of up and coming as well as established Australian writers, and I hope they continue to do so, although I would really like to see the balance between fiction and non fiction equal out a little bit, as I'm more interested in stories than essays. I like David Sedaris; he's very funny and clever-- particularly when it comes to essays; but these stories of animals behaving like humans shed no great light on the way of the world for me and I don't think this is a great place to start for those who are new to Sedaris. I have been reading this book on and off for almost a year, and I decided I would finally get rid of it from my currently reading pile-- while it was interesting to see what famous creative types did with their time to get their art made, I think this sort of information is far more suited to the blog which inspired it. I have a review scheduled for this book, due out in April, so you can look forward to that, but suffice to say it was amazing and you should definitely pre-order a copy or two. You can read my interview with Emma about the book here. I am becoming increasingly fond of the linked short story format, and this book was a great addition to that genre. It tells the stories of three generations of the Kelly familly, beginning after the Second World War and tracing up to the present day. The title story, Leaving Elvis won the 2013 ABR Elizabeth Jolley award. You can catch Michelle at an author talk at the Bookcaffe on March 15th. That's it from me! What did you read last month?